Part 5 of this series on developing the business case for investing in supplier relationship management (SRM) capabilities focuses on assessing stakeholder satisfaction with current SRM practices. When SRM is neglected, the speed of contracting, supplier responses to performance issues, and the ease of collaboration between all parties — suppliers, procurement and internal stakeholders — tends to suffer. The best way to identify key pain points is to conduct thorough surveys of both your suppliers and internal stakeholders. This will help you understand the wider picture, highlighting common threads that harm your ability to work effectively with suppliers. The key to interviewing success is priming the interviewee with open-ended questions (e.g., What does good supplier performance look like in your area? ), then gradually becoming more specific (How often do suppliers fail to meet expectations at the first attempt? ), and finally including questions on overall assessment (Who are your top three performing suppliers and why?). Don’t be surprised if top-performing suppliers at one business unit are perceived as poor performers in another. Without the objective data and dashboard capabilities that effective SRM provides, stakeholder perceptions are often based on isolated events that may not reflect a supplier’s wider performance. We’ve even seen instances where a company’s own culture was cited as the primary impediment to improved supplier performance. At one manufacturing company, we asked stakeholders to describe issues that had occurred with suppliers at their site. 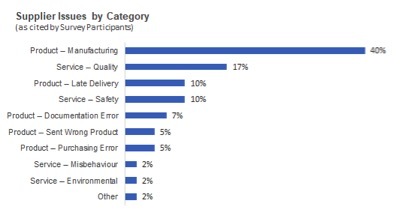 The results summarized in the figure below showed product manufacturing defects were the most prevalent problem. This helped build the case for conducting onsite assessments of the company’s critical suppliers. Insights like these are critical when communicating stakeholder viewpoints to management. A dynamic SRM solution enables you to survey your stakeholders and suppliers, compile your findings along with those from face-to-face interviews, and visualize your findings as bar charts and data tables. This “Voice of the Customer” is a critical component of your SRM business case. The next and final part of the series will focus on bringing the business case together to form a strong, multi-faceted argument supporting investment in SRM.